Directors’ Meetings: Will be held quarterly, as needed. Woody Graham International Olympic Goal Trophy. This trophy awards the highest annual CKAP km regardless of gender or country including Canadians. It is backdated to 1975 with 20 USA and 12 Canadian winners. See Photo Gallery 3. The AGM will be held the first week in May. James indicated that notice would be sent with the CKAP Annual Report in March. This Program has been moved to the 25,000 km Bicycle Incentive Program. 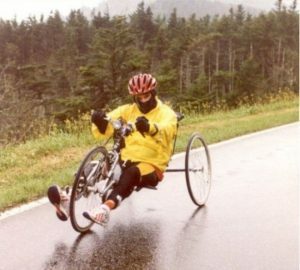 Handcyclist can still choose to participate in the Bicycle 25,000 Km or Special Needs 15,000 Km Incentive Programs by indicating their choice on the Registration Form and yearly Cycling Logs. All certificates and medals will show the actual km level achieved. 15,000 Km Incentive Program has now become the Special Needs Incentive Program. You must indicate on your Registration Form and yearly Cycling Logs that you wish to participate in the Special Needs Program. Only human powered vehicles may participate. Please see CKAP’s Main Page for more program Information. Comment would be appreciated by the board from our members. (ACBR) is the largest and most enjoyable cycling event in Atlantic Canada, yet small enough to allow CKAP members to enjoy each others company. The annual ACBR is organised by CKAP Director Gary Conrod CKAP 232 and happens with the help of his many volunteers. Please use the “Link” provided and enjoy a really great weekend bicycle rally each year. 26th. Annual ASSAULT on Mt. Mitchell is 102 miles and over 11,000 cumulative feet in climbing. The 2001 Assault had LIGHTNING, torrential RAIN, and really big HAIL !!! It was SO MUCH FUN !!! We have a strange idea of fun. this year I’m trying to get a few other hand cyclist to try it out. This was my sixth Assault with my arms and I’m the only hand cyclist to ever do the Assault or attempt it to date. Van and another rider. Van was dragged 656 feet and sustained multiple injuries. Enclosed is the cheque to order Judy’s CKAP short sleeve jersey in a medium. (has received). As I said in the e-mail, Judy had a Scleroderma renal crisis on December 2nd. which almost took her, which included 3 days in the ICU in Belleville and 4 days in the Cardiac ICU in Kingston. Scleroderma is a member of the Arthritis family, there is no cure and it is a progressive disease that builds collagens under the skin. It can also attack the heart / lung and kidneys. Judy’s Rheumatologist is super pleased with her results and progress. I thought I’d share with you her charts considering that she will probably get a blood transfusion tomorrow, due to an ulcer that resists curing. This is from when she got permission to get on the trainer on Feb. 23rd. Hopefully things will get straightened around next week on her 4th. Endoscopy and Cauterization and she hopes to get on the road very soon. Larry and I were really upset to hear about your accident. from reports it appears that you are doing much better but still have a long road to go. Remember if Lance can do it, so can you. James is doing much better, I’m home on the weekends and I managed to weed the front lawn this weekend with a long handle weeder although I walked like a puppet, very jerky, but I managed to finish. Since my release from the hospital I started cycling with permission from my doctors, in the basement and since Feb. 23rd. 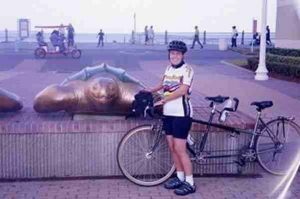 I have cycled 1,500 km.Some of these kilometers were tougher than others as I have had Gave’s Syndrome (blood vessel leakers in the duodenum) which caused my red blood cell count to drop resulting in 5 transfusions. The condition has since been corrected and I could have been getting some km’s on the road, However, the extreme heat has relegated this season to be in the basement but as you can see I have surpassed 1,500 km. I am really anxious to get back on the road and when everything is settled down I will. The bike in the basement makes me stronger every day and I can now ride 13 km in 30 minutes. So when my CKAP mileage comes in and it looks like I haven’t been doing much you’ll know I didn’t give up. We really hope that you continue to feel better, are able to get back on your bike and we will keep you in our prayers. James hopes to be able to get a few rides on my bike this year, but I have to learn to walk before I can ride. James and all CKAP members wish Judy continued recovery and the hope you can put it all behind you and will be able to hit the road with Larry in the near future.